Make your mark with a degree from the Quinlan School of Business at Loyola University Chicago. Our nationally ranked business education – embedded in Chicago’s vibrant business community – will accelerate your professional journey and give you the skills and knowledge to be the difference the world needs. The paths students take to Quinlan and where they go from here are as unique as each of our students. But you and your classmates will have one important thing in common: a shared calling to think beyond the bottom line. Like you, Quinlan students are curious, compassionate, driven, and innovative. And like you, they are ready for the next step in their careers as responsible business leaders. At Quinlan, our success is measured by your success: not only your professional accomplishments, but also by your impact on your industry, community, and society as a whole. Highly accessible faculty: Our faculty is committed to your success and readily available to students. They are experts in their fields, recognized researchers, and passionate teachers. 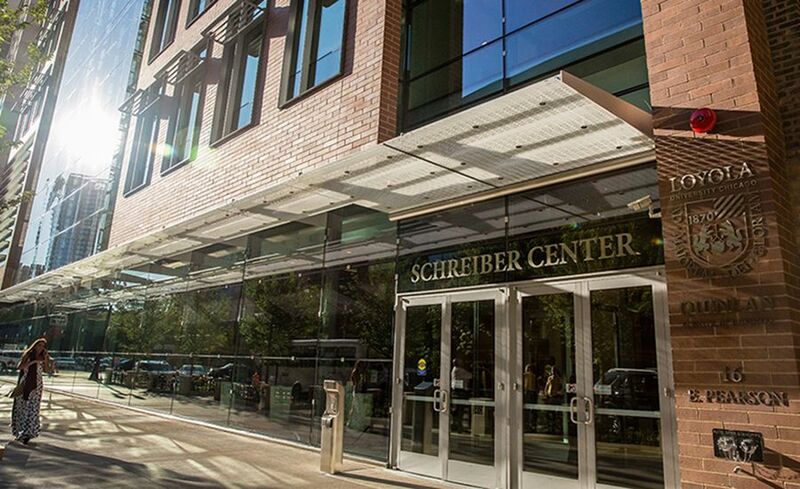 Convenient location: You will learn and network in the heart of Chicago in the new Schreiber Center, which is just steps from the CTA Red Line and Chicago’s Magnificent Mile. Classes are also held online and in north suburban Vernon Hills. Flexible scheduling: Undergraduate classes are offered on a semester system. Graduate classes are offered in the evenings and on weekends on 10-week quarter system. You can start a graduate program in any quarter and take on-campus or online classes at your own speed. Student life: Enrich your academic experience by engaging with active student organizations at both the undergraduate and graduate levels. You can also select from our many study abroad options to expand your global business skills and grow your network. Strong alumni network: You will join a strong, diverse network of more than 30,000 business alumni in Chicago and worldwide—who are all committed to making a difference through responsible business leadership. Scholarship and financial aid: You can qualify for competitive scholarships and other financial aid. Jesuit network: Attending Loyola gives you access to a global Jesuit network. Including Loyola, there are 28 Jesuit colleges and universities in the United States and many more internationally. Students in our MBA program have unparalleled flexibility to transfer credits to another participating Jesuit school if they need to relocate for personal or professional reasons during their graduate program. Our undergraduate business program is ranked No. 63 in the nation by Bloomberg Businessweek (2016) and No. 80 in the nation by U.S. News & World Report (2016). The U.S. News ranking places us in the top 20% of programs nationally and tied as the No. 1 Chicago-area program. Focused on responsible leadership, the Quinlan School of Business at Loyola University Chicago offers undergraduate, graduate, and executive education in the heart of downtown Chicago, with campuses and partnerships in Rome, Beijing, and Saigon–Ho Chi Minh City. Founded in 1922, the school was an early pioneer in Jesuit business education and is firmly grounded in ethics. The school is named for Michael R. Quinlan, a double Loyola alumnus and former McDonald's chairman and CEO.